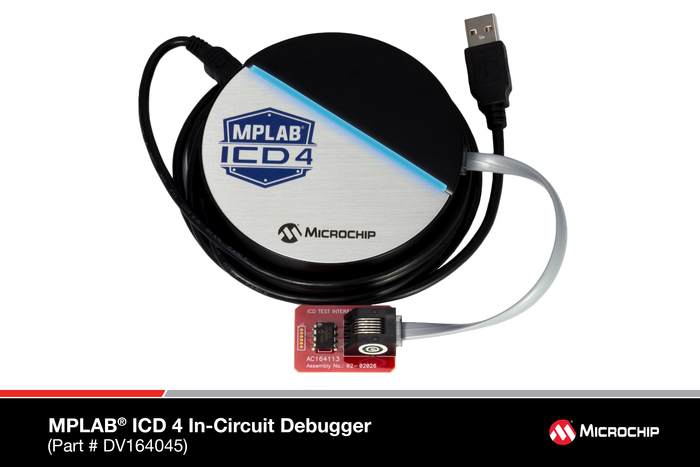 The MPLAB® ICD 4 In-Circuit Debugger/Programmer is Microchip’s fastest, cost-effective debugging and programming tool for PIC® Microcontrollers (MCUs), dsPIC® Digital Signal Controllers (DSCs), and CEC flash microcontrollers. This speed is provided by a SAME70 MCU with 300 MHz, 32-bit MCU with 2MB of RAM and a high-speed FPGA to yield faster communications, downloads and debugging. It debugs and programs with the powerful, yet easy-to-use graphical user interface of MPLAB X Integrated Development Environment (IDE). The MPLAB ICD 4 is connected to your PC using a high-speed USB 2.0 interface and is connected to the target with a debugging connector which is also compatible with the MPLAB ICD 3 or MPLAB REAL ICE™ In-Circuit Emulator systems. The MPLAB ICD 4 also works with JTAG interfaces. * This functionality is coming soon with firmware update of the product through MPLAB X IDE. Note: The PICKit 4 is compatible with MPLAB X IDE version 4.15. Download Now. The MPLAB PICkit 4 User's Guide information can be found in the Help section of MPLAB X IDE. Our most affordable debugger has power to impress. Note: The Snap is compatible with MPLAB X IDE version 5.05 and later. Download MPLAB X IDE Now. Files are available for creating an MPLAB Snap enclosure from Thingiverse here.